Movie weekend has arrived at our house. Over the holiday break we try to hit as many new movies as possible, because man, that’s when all the good ones for the entire come out. All at the same time. Do you do this? Now that our kids are old enough to sit through (and enjoy) movies, we take full advantage of all the bounteous Hollywood movie glory available. This weekend I’d really like to see the movie: This is 40. Have you heard of it? It opens today, and even though I didn’t want to see it initially (I’m closer to 40 than I’d like to admit, and totally leery of anything reminding me of it), now I’m dying to see it with my husband. The preview kills me. Clearly Judd Apatow has been married for awhile to have written and directed a movie so (painfully) close to the truth. I think the best part is that the movie stars Apatow’s real life wife, Leslie Mann. Hilarious. So what does any of this have to do with you? 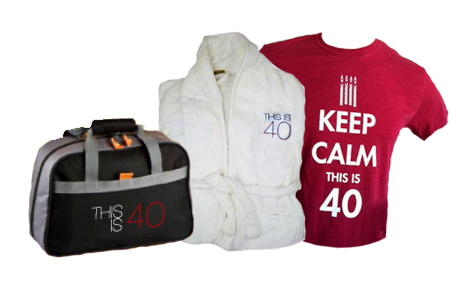 Aside from the fact that you need to go see this move ASAP, I’ve got a little sponsored giveaway: a This is 40 movie prize pack for one of you lovelies. To enter the movie giveaway leave a comment on this post with your contact information so you can be contacted if you win. The giveaway will last one week, ending at midnight MST on Friday December 28, 2012. Good luck, and happy holidays! I turned 40 this year but I don’t know if I can relate to this movie. Also, need a babysitter! yes please – closer to 40 than 30 now. BOO! and those are Apatow’s kids in the movie too. Love love love Paul Rudd. He can do no wrong. This movie looks like a winner. This is such a great cast of actors. I just turned 30, which was hard enough.Thank goodness 40 is a llittle ways away. Having passed 40 a while back, I can testify that it only gets better! And, even at my ripe old age of 60, date nights are a lot of fun! I would love to see this movie. I love Paul Rudd and Judd Apatow’s movies are hilarious!! I would love to take the hubby on a date night! That movie looks awesome! We don’t go to many movies in the theater because our kids are little. This one might be worth getting a sitter for! I can’t wait to see this movie and a few others over Christmas, we may even do a movie marathon over the holidays!! Can’t wait to relax with loved ones next week! Merry Christmas everyone and I love your blog Allison! What a great giveaway! Thanks for offering it. Cool! The exercise stuff would be especially nice to win! Previews look hilarious! I love going to the movies around the holidays too! bnheskelson at hotmail dot com. This movie looks a lot like my life right now :) And I could use a date night too! Thanks! Awesome! I didn’t know his real life wife is in it- so cool. I agree with the above commentors – Paul Rudd rules. So excited for it!!! That woman is SO funny; I loved her in seventeen again. This movie is definitely on the top of my list. When I was younger 40 seemed so far away, and now I am right there. Oh…I have seen 40. And maybe even 42. This is definitely on my list to see next week with my hubby! Can’t wait!! We’d love to create a movie marathon tradition this week too. Thanks! I loved them in Knocked Up and I’m looking forward to seeing this! Saw this movie the other night with my husband. We loved all the funny parts. Cracked us up! Looking forward to seeing the movie…all the goodies will really make it special! Love your site, giving out the sugar scrub as KWANZAA gifts! Peace and blessings. Happy Holidays!